1Department of Biotechnology, Ayya Nadar Janaki Ammal college, Sivakasi-626124, Tamilnadu, India. 2Department of Microbiology, Ayya Nadar Janaki Ammal college, Sivakasi-626124, Tamilnadu, India. 3Department of Botany, Scott Christian College, Nagercoil 629001, KK Dist, Tamilnadu, India. Marine macroalgae act as the prominent source of marine natural products. The presence study was carried out to investigate the potential bioactive metabolites in the marine algae Valoniopsis pachynema and Sargassum swartzii and to detect its antimicrobial properties. The bioactive metabolites were screened using the phytochemical analysis, UV, FTIR and HPLC analysis. Antibacterial activity was tested against five different strains such as Staphylococcus aureus, Pseudomonas aeruginosa, Escherichia coli, klebsiella pnuemoniae and Bacillus subtilis by agar disc diffusion method. Antifungal activity was detected against various organisms such as the Aspergillus niger and Penicillin notatum using agar well diffusion method. The presence of bioactive metabolites such as terpenoids, flavonoids was detected. These results indicate that Valoniopsis pachynema and Sargassum swartzii could be used for the development of marine derived drugs. Marine algae have been classified into three classes based on the pigmentation namely brown, red and green algae. Then it was referred as Phaeophyceae, Rhodophyceae and Chlorophyceae . Seaweeds are rich with various sources of bioactive natural products, so it has been used as potential biocidal and pharmaceutical agents . The cholorophyceae algae have highest antibacterial activities against gram positive and gram negative organisms . Seaweeds are considered to produce secondary metabolites as characterized with the broad spectrum of biological activities such as antibacterial and antifungal activities . The edible seaweeds species of kappaphycus (red algae) and padina (brown algae) are from the coast of Tamilnadu. They contain a significant amount of the protein, vitamins and minerals essential for human nutrition . The antiviral activities of the sulfated Fucoidan which was extracted from Sargassum latifolium found to contain high molecular weight compounds . The macro algae phaeophyceae (scytosiphongracilis) have high quantity of protein contents and was used in proteomic studies . Seaweeds are known to contain reactive antioxidant molecules such as ascorbate and glutathione (GSH). Then the secondary metabolites include carotenoids α- and β-carotene, fucoxanthin, astaxanthin, mycosporine like aminoacids (mycosporine-glycin) and cateehins (eg., catechin, epigallocateechin, gallate, phlorotamins (eg., phloroglucinol) echol, and tocopherols . Red algae especially many species of the genus laurencia (order ceramiales, and family Rhodomelaceae) are considered to be the rich source of secondary metabolites. The cytotoxic activity was induced by chemical compounds obtained from marine algae such as polyketides, terpenes, nitrogen containing compounds and polysaccharides . Fucoidan a sulfated polysaccharide found in brown algae, showed inhibitory action against the growth of colorectal cancer . Fucoidan found in Fucucvesicuclosus is a compound consists primarily of L-fucose and sulfate along with small quantities of D-galactose, D-manose, D-xylose and uronic acid. It has the ability to induce the apoptosis process in cells . The antioxidant and hepato protective activities of low molecular weight sulfated polysaccharide from Laminaria japoneia. The compounds fucoxanthin and phlorotannins identified in Sargassum fisellamanianum were also found to be an effective with antioxidant compound . Twenty four organic elements obtained from six marine algae, such as Lystoseriacompressa, Cystoseriacrinitia, Cystoseriasedoctes, Gelidiumlatifolium, Dictyopterismembranaceae and Halurusequisetifolius collected from Tunsian Mediterrancan coasts, exhibited antibacterial activity against the four bacteria strains, Staphylococcus aureus, E. coli, Staphylococcus epidermis and Micrococcus luteus. The chloroformic and ethyl acetate extract obtained from Cystoseria critina and Cystoserium sedoides showed high antifungal activity against candida strains . The algae after drying were weighed and then chopped. Algae extracts were prepared by using direct extraction method. The samples were weighed and dissolved in methanol. It was kept for 24 hrs at room temperature and mixed at regular intervals. After 24 hrs the dissolved samples were filtered using Whatman filter paper and stored for further use. a) Detection of carbohydrates: To 0.5 ml of filtrate 0.5 ml of Benedict’s reagent was added. The mixture was heated on a boiling water bath for 2 min and after that observed for characteristic red colored precipitate formation (Benedict’s test). b) Detection of proteins and amino acids: The extract (100 mg) was dissolved in 10 ml of distilled water and filtered through Whatman no.1 filter paper and the filtrate is subjected to tests for proteins and amino acids. To 2 ml of filtrate, few drops of Millon’s reagent were added and were observed for white precipitate (Millon’s test). c) Detection of terpenoids: Salkowski test: 5 ml of each extract was mixed in 2 ml of chloroform and concentrated sulfuric acid was added to form a layer and then it was observed for reddish brown coloration of the interface. d) Detection of phenolic compounds: The extract (50 mg) was dissolved in 5 ml of distilled water. To this few drops of neutral ferric chloride solution was added and observed for a dark green coloration. e) Test for cardiac glycosides: Keller-Killani test: 5 ml of each extract was treated with 2 ml of glacial acetic acid containing 1 drop of ferric chloride solution. It was added with 1 ml of concentrated sulfuric acid. A brown ring of the interface indicates a deoxysugar characteristic of cardenolides. A violet ring may appear below the brown ring while in the acetic acid layer a greenish ring may form just gradually throughout thin layer. f) Detection of flavonoids: To 5 ml of dilute ammonia solution a portion of the aqueous filtrate of each algal extract followed by addition of concentrated sulphuric acid. It was observed for a yellow coloration. The yellow coloration disappears on standing. g) Detection for saponins: Two grams of the powdered sample was boiled in 20 ml of distilled water in a water bath and filtered. 10 ml of filtrate was mixed with 5 ml of distilled water and shaken vigorously for a stable persistent froth. The frothing was mixed with 3 drops of olive oil and shaken vigorously, then observed for the formation of emulsion. i) Detection of steroids: 2 ml of acetic anhydride was added to 0.5 g methanolic extract of each sample with 2 ml of sulfuric acid and this was observed for colour change from violet to blue or green in some samples. j) Detection of alkaloids: Preparation of filtrate solvent free extract (50 mg) was stirred with 2 ml of dilute hydrochloric acid and filtered. To 1 ml of filtrate a drop of Mayer’s reagent was added by the side of tube and then observed for a white creamy precipitate. The agar disc diffusion method was followed for the antibacterial susceptibility test. The 6 mm discs were impregnated with various concentrations such as 20 μl, 40 μl, 60 μl of methanolic extracts and the discs are placed in the sterile Muller Hinton agar plates. The plates were incubated at 35°C for 24-28 hr and the inhibition zones were measured around the discs. Control was maintained with solvent alone . Antibacterial activity was tested against five different strains such as Staphylococcus aureus, Pseudomonas aeruginosa, Escherichia coli, klebsiella pnuemoniae, Bacillus subtilis. The strains were swabbed in the sterile agar and the discs were placed in it. The antifungal activity was determined by the standard agar well diffusion method . Petri plates were prepared by pouring 20 ml of Potato dextrose agar and allowed to solidify for the use of susceptibility test against Aspergilus niger, Penicillin notatum. Plates were dried and 0.1 ml of standardized inoculum suspension was poured. Well were cut at 6 mm diameter. After adding the extracts at various concentrations the plates were incubated at 28°C for 48 hr. The UV-VIS spectroscopy analysis was done by using UV-1700 series SHIMADZU. The absorbance was taken with the wavelength ranges from 170 nm to detect the compounds present in the algae crude extracts. The FT-IR analysis of sample was carried for marine algal extracts (1 mg) was taken in a smooth agitate mortar and thoroughly mixed with 2.5 mg of dry potassium bromide (KBr) using a pestle. The powder was filled in the micro-cup of 2 mm internal diameter to obtain the diffuse reflectance infrared spectrum for replicate samples. All the IR spectra were recorded at room temperature (26°C or 10°C) in the mid infrared range (40000.400 cm-1) using FT-IR spectrum RX I, Forier Transform Infrared Spectrometer (PerkinElmer, USA). Typically, 20 scans were signal-averaged for a single spectrum. Each spectrum was displayed in terms of absorbance as calculated from the reflectance-absorbance spectrum using the Hyper-IR software. The crude extracts were quantified by HPLC SHIMADZU, LC-10 at VP series machine from the 1.5 ml volume of each crude extracts saved for HPLG CQUANTIFICATION, 200 μl were trasferred to a vial and the solvent removed by speed vacccum concentration. The obtained residue was dissolved in 500 μl acetonitrile: water 1:1 +0.5% trifluroacetic acid and 10 μl injected by auto sampling into a HPLC. Finally the compounds were analysed based on the retention time. Table 1 shows the phytochemical analysis of seaweeds namely Valoniopsis pachynema and Sargassum swartzii. It represents the presence of various phytochemicals such as aminoacid, protein, steroids, phytosterols, saponins, caridacglucosides, terpenoids, flavonoids, carbohydrates,alkaloids are found in both the algae (Table 1). Table 1 . Phytochemical analysis o f Valoniopsis pachynema and Sargassum swartzii. The Plate 1-5 showed the antibacterial activity of marine algae such as Valoniopsis pachynema extracts against human pathogens E. coli, Staphylococcus, Klebsiella, Bacillus substilis, Pseudomonos. The extracts were measured at the concentration of 20 μl, 40 μl, 60 μl. The zone of inhibition maximum was found in Psedomonas and Klebsiella as 7 mm at 60 μl and 8 mm at 60 μl diameter. Minimum diameter zones were 3 mm at 60 μl in staphylococcus, Bacillus and E. coli (Figure 1). Figure 1. Antibacterial activity of Valoniopsis pachynema against bacterial isolates. 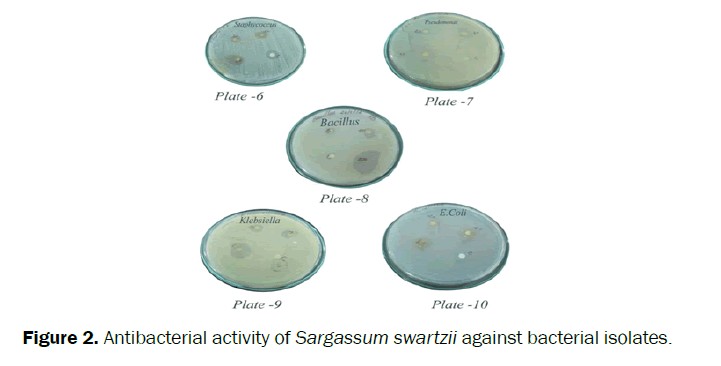 Plate 6-10 showed the antibacterial activity of marine algae such as Sargassum swartzii extracts against human pathogens E. coli, Staphylococcus, Klebsiella, Bacillus substilis, Pseudomonos showed maximum zone of inhibition. Maximum zone of inhibition was found in Bacillus at 60 μl concentration as 6 mm diameter and minimum inhibition was seen in staphylococcus at 60 μl as 2 mm diameter (Figure 2). Figure 2. Antibacterial activity of Sargassum swartzii against bacterial isolates. 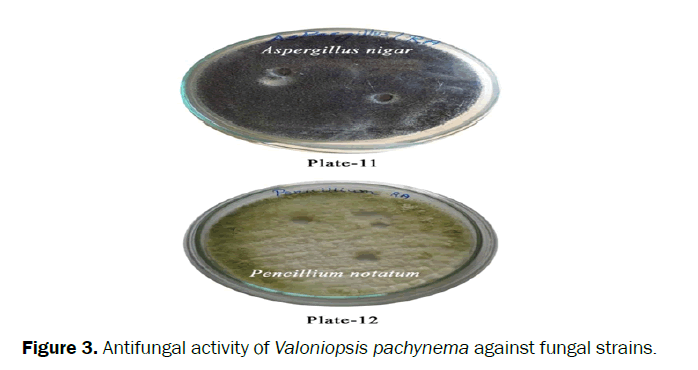 Plate 11-12 showed the antifungal activity of marine algae such as Valoniopsis pachynema extract against Aspergillus niger and Penicillium notatum (Figure 3). Figure 3. Antifungal activity of Valoniopsis pachynema against fungal strains. Plate 13-14 showed the antifungal activity of marine algae such as Sargassum swartzii against Aspergillus niger and Penicillium notatum (Figure 4). Figure 4. Antifungal activity of Sargassum swartzii against fungal strains. Figure 5 shows the UV analysis for the methanolic extracts of the marine algae Valoniopsis pachynema It denotes the wavelength ranges from 190 λ to 600 λ. Figure 5. UV analysis of marine algae Valoniopsis pachynema. Figure 6. UV analysis of marine algae Sargassum swartzii. Figure 7 reviews the FT-IR spectrum of the marine algae Valoniopsis pachynema. It was measured at 400-4000 nm. Maximum absorbance were measured at different wavelengths. Figure 7. FTIR analysis of Marine Algae Valoniopsis pachynema. The FT-IR spectrum of the marine algae Sargassum swartzii was shown in Figure 8. It was observed that various aliphatic and aromatic compounds are seen in it. Figure 8. FTIR analysis of Marine Algae Sargassum swartzii. Figure 9 analyses the HPLC analysis of the marine derived compounds from the marine algae Valoniopsis pachynema. Highest peak denotes the presence of active compounds steroids and alkaloids at the retention time of 1.947 and 2.790 in Valoniopsis pachynema. Figure 9. 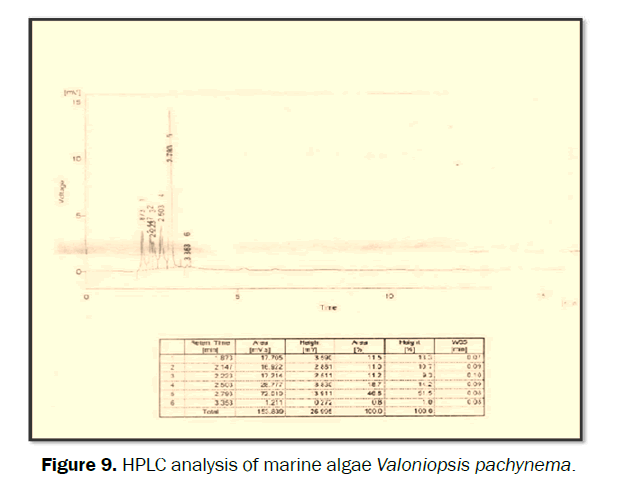 HPLC analysis of marine algae Valoniopsis pachynema. Figure 10. 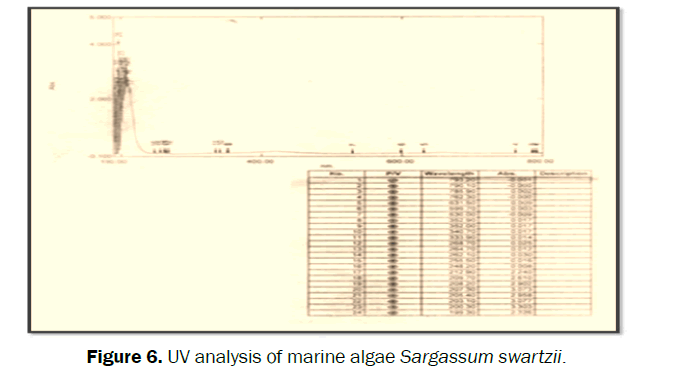 HPLC analysis of marine algae Sargassum swartzii. The algal extracts were more effective against Gram (+) than Gram (-) bacteria, due to more complex structure in the cell wall of Gram (-) bacteria . In the present work the extracts of Valonopsis pachynema and Sargassum swartzii exhibited antifungal and antibacterial activity. Seaweeds such as Acrosiphonia orientalis and Stocheospermum marginatum from the Indian Ocean exhibited antibacterial activity against the Gram positive and Gram negative organisms . The presence of terpenoids, flavonoids, sterols, steroids in the algae Valonopsis pachynema and Sargassum swartzii could induce the antimicrobial properties against the Gram positive and Gram negative organisms. The methanol extract of Sargassum vulgare showed antibacterial activity against Escherichia coli and Staphylococcus aereus . The phenolic compounds were seen at high concentrations in brown algae A. taxiformis and S. vulgare . Similarly the marine algae Valonopsis pachynema and Sargassum swartzii are rich in phenolic compounds. Algae Laurencia okamurae, Grateloupia elliptica, Sargassum thunbergii, Gloiopeltis furcata, and Hizikia fusiformis, act as potent inhibitors of the production of pro-inflammatory mediators such as nitric oxide (NO), prostaglandin E2 (PGE2), interleukin-6 (IL-6), and tumor necrosis factor-α (TNF-α) . Fucan is a polysaccharide which contains substantial percentages of L-fucose and sulfate ester groups . Heterofucans from Sargassum filipendula showed antiproliferative activity against HeLa, PC3 and HepG2 cells. The alcoholic extract of red alga Acanthophora spicifera has been found to inhibit tumours in mouse model . The methanolic extracts of Valonopsis pachynema and Sargassum swartzii showed tremendous antifungal activities against the fungal strains such as Aspergillus niger and Penicillium notatum. The various organic and aqueous extracts of Skeletonema costatum were active against different species of Skeletonema costatum, Klebsiella, and Proteus vulgaris . The antimicrobial activity of Arthrospira maxima using different concentrations of aqueous and methanolic extracts, it was against Proteus vulgaris, Staphylococcus aureus, Bacillus subtilis, Escherichia coli and Candida albicans . The in vitro and in vivo antifungal activity of the methanol extract of G. changii against systemic candidiasis. The effect of Gracilaria changii was studied against Candida albicans . The Brazilian’s northeast coasts have a great variety of seaweeds with bioactivity potential . Few pharmacological investigations were carried out to identify new drugs. Then the antioxidant, anti-inflammatory, and antiproliferative activities from the organic fractions of Cystoseira sedoides from the Tunisian coast was analysed . The present study proved that the marine algae Valonopsis pachynema and Sargassum swartzii showed antimicrobial activities due the availability of various bioactive metabolites in the extracts. The presence of various compounds such as alkaloids, Flavonoids, terpenoids indicated that it could be used as the natural products for pharmacological activities. Marine algae are the valuable sources of marine ecosystem. Marine algae act as the source of bioactive metabolites that produce a wide range of antimicrobial potentials. The phytochemical analysis of seaweeds evaluated the presence of various secondary metabolites such as phenols, terpenes, saponins, proteins, steroids, carbohydrates etc. The presence of various bioactive metabolites was detected by using UV, FTIR and HPLC analysis. From the study it is confirmed that the Valonopsis pachynema and Sargassum swartzii algae could be used for the development of drugs. AL-Haj NA, Mashan NI, Shamudin MN.Antibacterial activity in marine algae Eucheuma denticulation against Staphylococcus aureusand Streptococcus pyogenes. Research Journal of. Biology Science. 2009; 9(4): 519-524. Aslam M, S. Sujith GSK, Selvin J, Shakir C. Cytotoxic Potentials of red algae, Laurenciabrandenii Collected from the Indian Coast. Global J Phar. 2009; 3(2): 90-94. Asser M, Sujith S, Kuran GS, selves J, shales C. Cytotoxic potentials of red algae, laureniabrandenii collected from the Indian coast. Global Journal of Pharmacology.2009; 3(2): 90-94. Bauer AWM, Kirby M, Sherris C, Truck M. Antibiotic susceptibility testing by a standarized single disc method.American Journal of Clinical Pathology. 1996; 45(4): 493-496. Caballero OP, Melian FR. Antimicrobial activities in marine algae extracts from the coast of Grand Canary Island.Bentos. 1990; 6: 31-35. Cox S, Abu-Ghannam N, Gupta S. An assessment of the antioxidant and antimicrobial activity of six species of edible Irish seaweeds. International journal of Food Research. 2010; 17: 205-220. Chiheb I, Hassane R, Jose ML, Francisco DSJ, Antonio GVJ, et.al. Screening of antibacterial activity in marine green and brown macroalgae from the coast of Morocco. Afr J Biotechnol. 2009; 8(7): 1258-1262. Demirel Z,Yilmaz-koz FF, Karabay-yavasoglu NU, Ozdemir G, Sukatar A. Antimicrobial and antioxidant activity of brown algae from the Aegeaan sea. J Serbian Chemical Societ. 2009;74(6): 619-628. Jemal A, Siegel R, Warel E, Hao Y, Xc J, et.al. Cancer Statistics.CA cancer Journal of clinical. 2009;88(2): 71-96. Karting T, Still F, Reinthaler F. Antimicrobial activity of the essential oil of young pine shoots.Journal of Ethanopharmacology.1991; 35: 155-157. Lamia M, Chaieb K, Bouraoui A. Evaluation of Antimicrobial activity of organic fractions of six Marine algae from Tunisian coasts.Inter Jpharandpharsci. 2012; 4(1): 0975-1491. Lamia M,Kamel C, bouraoul A.Evalutin of antimicrobial activity of organic fractions of six marine algae from tunsian Mediterranean coasts.International journal of pharmacy and pharmaceutical sciences. 2012; 4:0975-1491. Li X, Jacob MR, Ding V,Agarual AK, Smiltie TJ, et.al. Capisterones A and B, which enhance Floconozole activity in saccharomyces cerevisiae, from the marine green algae pencilliescaptatus.Journal of Natural product.2006; 69:542-546. Masuda Y,Kodama N, Nanba H. Macrophage J774.1 cells is activated by MZ- Fraction polysaccharide in GrifaliafrondosaMycoscience. 2007; 47: 360-366. Mayer, A. M.S, Rodriguez A D, Berlinck R G S, Hamann M T (2007) Marine pharmacology in Comparative biochemistry and physiology 145 : 553-581. Medina M,Mandeva R, Dimova D, Poli A, Nicolus B, et.al. Production and characterization of a microbial glucan, synthesized by Geobacillustepidamans V264 isolated from Bulgarian hot spring. Carbohydrate polymers.2011;77: 338-343. Ming L,Poul E, Xiukun L.Bromophenols in marine algae and their bioactivities.Marine drugs. 2011;9: 1273-1292. Mohamed F,Namitho KK, Chodambara KN, Mahadeva M, Sarada R, et.al. Chemical composition, Iron bioavailability and antioxidant activity of Kappsphycusalvarori (Doty). Journal of Agriculture Food chemistry. 2005; 53: 792-797. Rangaiah GS, Lakshmi P, Manjula E. Antimicrobial activity of seaweeds Gracillaria, Padina and Sargassumsps, on clinical and phytopathogens. International Journal of Chemical and Analytical Science. 2010;1(6): 114-117. Renukaabai N. Evaluation of bracilariafurgusonii for phytochemical analysis and antibacterial activity- Plant. archives. 2010;10 (2): 711-713. Santhanam S,Manilal A, Sujith S, Selvin J, Kiran GS, et.al. Antimicrobial activity of seaweeds extracts against multiresistant pathogens. Annals of Microbiology. 2008; 58(3): 535-541. Tuney I,Cardirci BH, Unal D, Sukatar A,Hiney MP. Antimicrobial activities of the extracts of marine algae from the coast of Urla (izmir. Turkey). Turk J Biol. 2006; 30: 171-175. Yan S, Zhang A, Su Z, Sun W. Comparative proteomic analysis provides new insights into chilling stress response in rice. Molecular cell biology proteomers. 2006;5: 485-96. Yuan YV, Bone DE, Larrington MF.Antioxidant activity of dulse (Palmariapalmata) extract evaluated in vitro. Food chemistry. 2005; 91: 485-494. Zahra R,Mehrnaz M, Farzaneh v, Kohzad s. Antioxidant activity of extract from a brown alga, Sargassumboveanum.African Journal of Biotechnology. 2007; 6(24): 2740-2745. Zhao X,Xue LTD, Zi LI, cai YP, lai HY, et.al. Antioxidant and hepato protective activities of low molecules weight sulfated polysaccharides from canninariasaponinaria .Journal of Applied phyxology.2009;16:111-118.